A piece of sky is unique, something that will only ever occur once and, despite certain theories involving infinite monkeys, will never be repeated exactly. The piece is defined by the time, weather, temperature and ultimately any outside effects upon this. It is because of these variables that certain skies and the pieces that make up them are more memorable than others. Each person has their own memorable pieces, perhaps the moonlit night where they first kissed their crush at a young age, the sparkling dawn as they awoke after a heavy night drinking or the sorrowful grey clouds of when they lost a favourite pet. All these pieces have memories attached to them and emotions that help define them. I want to talk about one piece of sky, one special piece that defined not only a single person, but millions upon millions of people afterwards. A piece of sky so unique, so defining that it has sparked debates, caused uproar and both begun and ended wars. This piece stood above many, but most of them could not see it and would never be able to see any sky again. I was amongst the few below this sky to have lived to speak of it. This piece of sky is mine, but I wish it was not. This piece of sky is everyone’s, but I wish this was not the case. 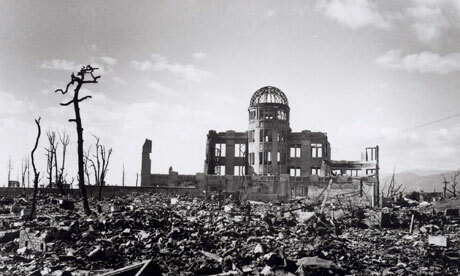 This piece of sky occurred at exactly eight fifteen above the city of Hiroshima 6th August 1945. This piece of sky will never die, no matter how much I wish it would. ← Previous Post Welcome to Inkblots!